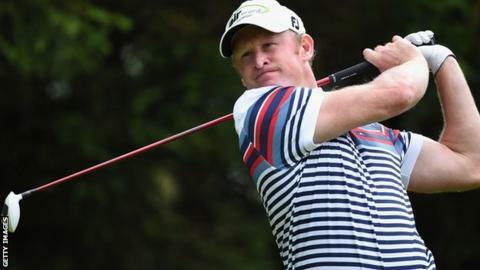 Jamie Donaldson is hoping for further success in the Wales Open at Celtic Manor ahead of his Ryder Cup debut. Welshman Donaldson, 38, secured his place in the European team by winning the Czech Masters in August. Lee Westwood, Stephen Gallacher and Thomas Bjorn will also be preparing for the Ryder Cup in Scotland next week by playing in Newport. "If I can win again going into the Ryder Cup then you absolutely can't be more ready," said Donaldson. "The good thing is that the form has been good of late so whatever happens I'll be going into the Ryder Cup on good form." The Wales Open, which begins on Thursday, will be played on the Twenty-Ten Course on which Europe won the Ryder Cup in 2010. Europe team captain Paul McGinley, who won the Wales Open in 2001, requested the Celtic Manor course to be set out like Gleneagles, the venue for the 2014 Ryder Cup. "I've let the players all know that it was going to be set up in that way in terms of rough heights, green speeds and all the kind of things they're going to encounter when they go up to Gleaneagles," McGinley said. "It's like sitting an examination paper," McGinley said. "Every examination paper is different but I tried to make the Celtic Manor course here as similar to Gleneagles in terms of all of those things the guys are going to encounter next week." This year's Wales Open will be the final tournament under the current contract as the Celtic Manor resort in Newport focus on other projects. Paul Casey, Ross Fisher, Francesco Molinari, Joost Luiten, Nicolas Colsaerts and David Howell have also entered to contest for the £300,000 first prize, won last year by Gregory Bourdy. Pontypridd-born Donaldson is aiming to become the first Welsh winner of the tournament, which has been held for the past 15 consecutive years. August's Czech Masters win was Donaldson's third European Tour title following his maiden victory at the Abu Dhabi Championship in 2012 and the 2013 Irish Open. "Three in three years is nice," Donaldson told BBC Wales Sport. "It took a while to win the first one but I suppose you never know when you're going to play well. "You never know at what time in your life you are going to play your best golf. "Some people play it from 22 to 28 maybe and some people peak later. I didn't win until I was 36 and I'm 39 in October. "It's been nice and let's see if I can pick that up and try and win more often. "It's very difficult to win on the European Tour; there's good strength in depth with so many good players. "But you have to go out there and try and shut the door."